30 + 50 x 45" engine from H.G. Trout Co of Buffalo; 2 - 8 1/2 x 17' firebox boilers. Burned & sunk 3 miles E. of Cana Island; cargo & machinery salvaged; engine into tug SMITH & 1 boiler into steamer J.L. HURD. 1884, Sep 17 Enrolled Buffalo, NY. 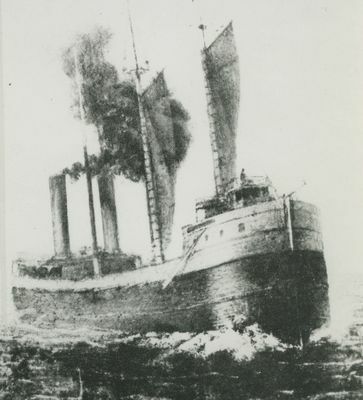 1884, Oct 3 Arrived Milwaukee maiden trip with 3,150 tons of salt, largest cargo ever carried by Great Lakes vessel. 1885, Apr 8 Contracted with Northwestern Fuel Co. to carry 75,000 tons coal from Buffalo, Erie & Ashtabula-Lake Superior ports. 1886, Sep 30 Owned N.P. Huntington & J.C. Corrigan, Cleveland, OH. 1887, Apr Beached Machinaw, avoiding ice floe. 1888, Mar Received one No.117 William steam steerer at $1,600. 1889, Apr 26 Stranded Gull Rock, Michigan Island, Lake Superior; freed by tug RECORD, badly damaged. 1889, May 8 Towed by tug MOCKING BIRD to Cleveland, damages $11,000; back in business 3 weeks later. 1891, Mar 23 Replaced 3 spars Toledo, OH. 1892, Feb 18 Enrolled Cleveland, change residence of managing owner to Wickliffe, OH. 1892, Nov 15 Steering gear gave out near Duluth. 1893, Aug 1 Owned Corrigan Transit Co., Wickliffe, OH. 1896, Oct 17 Burned & sank Whitefish Point; with coal from Lake Erie-Milwaukee, WI; crews rescued.